By Sandra Hindman, with Beatriz Chadour-Sampson, Reine Hadjadj, Jack Ogden, and Diana Scarisbrick, hardcover, illus., 258 pp., publ. by Paul Holberton Publishing, London, 2014, £35.00. 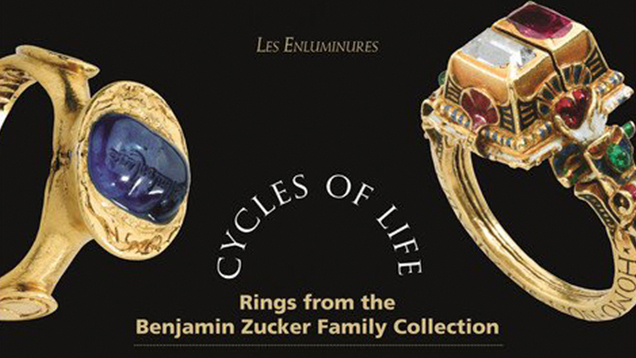 Cycles of Life: Rings from the Benjamin Zucker Family Collection celebrates 40 years of collecting by one of the world’s most notable gem dealers. The book is the third in Hindman’s series on recent exhibitions at Les Enluminures, her gallery specializing in manuscripts, miniatures, and jewelry from the Middle Ages and the Renaissance. Hindman presents a selection of rings from the Zucker collection, much of which has been on loan to the Walters Art Museum in Baltimore since 1985. They are organized according to the talismanic, symbolic and commemorative roles rings have played in birth, marriage, death, and everyday life, and even as a symbol of eternity. Although organized by life cycles, the rings also document the changes in styles through the ages. Hindman describes the forces that were often behind these changes, such as the discovery of Brazilian diamonds, which caused the proliferation of diamonds in rings; and the wars, disease, and plagues of the 1600s that led to the commemorative “memento mori” rings. It is also intriguing to see the continuity of jewelry design. Many of the pieces would not be out of place in a modern jewelry store: diamond solitaires, with the stones set high and with open sides so that light can enter; clusters of small diamonds that give the impression of greater size; and trios of diamonds set on the shoulders of rings. Hindman opens each section with an appropriate illustration from a medieval or Renaissance manuscript. Other reproductions of paintings and illuminations show how rings were actually worn in the past. My favorite illustration is from the beginning of the “Everyday Life” chapter. It shows a busy jewelry shop in the Middle Ages, with cloths spread with gems on the counters, and jewelry and vessels displayed on the shelves in the back. Change the clothing and it could be almost any family-run jewelry store today. As Hindman notes early on, rings often fit into multiple categories, and Cycles of Life is not meant to force them into rigid classifications. Instead, the book considers how, since the dawn of history, rings have encapsulated our hopes, our desires, our fears. “Birth” includes rings that offer prayers to Mary and Christ—both virgin births. A spectacular “gimmel”—or twin—ring, with its engraved and enameled interlocking shanks, opens to show a figure of a baby on one side and a skeleton on the other. It serves as a reminder of the importance of humility, signaling that the end of life is death, and that all things pass. “Marriage” features a broad selection of elaborate Jewish marriage rings—probably only worn during the wedding ceremony. Fascinating “key” rings indicate that, upon marriage, wives took on the keys to the stores and the responsibility of feeding the household. Most of the rings have been decorated with loving sentiments. Hindman traces the shift from the medieval practice of engraving sentiments on the outside of the ring shanks, in a public display, to the Renaissance practice of engraving them privately inside the rings. “Everyday Life” illustrates seal rings used for signing documents, rings engraved with crests and coats of arms identifying families, and gemstone rings worn not necessarily for vanity, but to invoke the special power and properties often associated with those stones. Medieval rings in the “Death” section show the well-warranted fears of mortality in that era. They are inscribed with charms and prayers, and set with stones believed to have magical properties. “Death jewelry,” writes Hindman, “appeared to have enjoyed a vogue” in the late Renaissance. These rings, worn in remembrance of a lost loved one, might today be considered gruesome: decorated with skulls and bones, or containing the hair of a deceased person. Such rings were often set with diamonds, a symbol of eternal life. Finally, “Eternity” tracks the evolution of the diamond ring from ancient Rome to the modern era. As Hindman writes, this section presents “a kind of mini-history of the diamond ring,” following the history of setting and cutting. Known since antiquity for their indestructibility, diamonds quite naturally became a symbol of eternity—hence their eventual use in betrothal and wedding rings. Diamonds represented the enduring nature of a monarch’s reign and, perhaps not inconsequentially, were believed to protect against poisoning. As already mentioned, diamonds in memento mori rings signified the eternal nature of the soul. The inclusion of perpetual calendar rings seems a bit out of place among so many diamonds, but is appropriate to rings dealing with eternity. This section acknowledges Benjamin Zucker’s long love affair with diamonds and diamond jewelry, and the important place they hold in his collection. Cycles of Life is primarily a catalog of an exhibition of the same name at Hindman’s Les Enluminures gallery in New York that ran from Oct. 30 to Dec. 6, 2014. Excellent notes on provenance and sources as well as comparable pieces make this a valuable resource for the specialist. It also makes absorbing reading for non-specialists with an interest in jewelry history; the notes and bibliography provide gateways to further study. Comparison pieces show how styles influenced and were influenced by others. Descriptions of shank shape, enameling and setting techniques, manufacturing methods, and metal types offer fascinating windows into the superb skills of jewelers through the ages. Notes on gemstones serve as a reminder of the extent of trade in the ancient world: Garnets from India and emeralds from Egypt appear in ancient Roman rings. In addition to the breadth of the collection, the quality of the pieces is astonishing. Many are in excellent shape, with gemstones and even enameling in place. Excellent photos taken from multiple angles allow the reader to examine minute details of each ring, from enameling and engraving to areas of damage and repair. In addition to the five sections—Birth, Marriage, Everyday Life, Death, and Eternity—the book includes a preface by Benjamin Zucker outlining his initiation into the world of ancient jewelry as a young man just out of Harvard, through his lifelong habit of collecting. There is also a bibliography of Zucker’s writing, and a separate bibliography of references. Cycles of Life would make a worthwhile addition to the library of anyone interested in jewelry history. Sharon Elaine Thompson is a Graduate Gemologist (GG) and Fellow of the Gemmological Association of Great Britain (FGA). She has been an instructor at the Gemological Institute of America, and has written extensively on jewelry and jewelry manufacturing for more than 25 years. She is currently working on a book on jewelry design, Good Bones: The Elements and Principles of Design for Jewelry Makers. Review of Yvonne J. Markowitz and Denise Doxey's Jewels of Ancient Nubia. Review of Stefano Papi’s Jewels of the Romanovs: Family & Court. Review of Diana Scarisbrick’s Rings: Jewelry of Power, Love and Loyalty.